Your chuckwagon supper and western stage show experience will last about 4 hours in total. You will start your evening off with a tour of our authentically replicated Western town including a plethora of attractions from an old time photo studio where you can get your pictures taken to taking roping lessons or even to dress up in clothes authentic to that era. After your tour, you will get to settle in and get to enjoy an authentically replicated, homecooked meal from the same era. The BBQ chicken, pork ribs, baked potatoes, cowboy beans, fluffy, homemade biscuits, and prickly pear coleslaw will be sure to leave you full and satisfied. Your choices of lemonades, iced teas, and coffees are included with your meal. Once you have enjoyed your delicious meal, you will get to enjoy some musical entertainment from the original Blazin M Cowboys themselves as they perform some classic, southern tunes that they share along with some poetry, comedy, and entertainment as they teach everyone real, authentic facts about the cowboys and their past and how they lived. Please note that the fee for this event does not include gratuity for your served meal (recommended, alcoholic beverages you may wish to consume, or hotel drop-off and pick-up fees. There will be vegetarian meals available only if requested through our "Special Requirements" form PRIOR to you arriving for your tour. Your fee for your tour DOES include entrance fees, dinner (non-alcoholic beverages included), light refreshments, entertainment, and any local taxes that will apply. 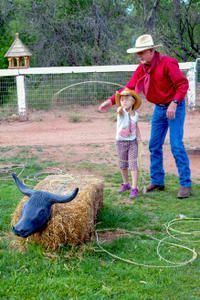 Just 30 minutes from Sedona is the Blazin' M Ranch, which has been providing visitors and locals with a Wild West experience for the last twenty years. Start your evening by exploring an authentically replicated Western town with an abundance of attractions and activities sure to delight and entertain! Check out the shooting gallery, get some ropin' lessons, ride a vintage tractor pull and much more! Visit the Red Garter Old-Tyme Photo Studio and dress up in Victorian, saloon girl or gunslinger regalia and take home a memory of your visit! Listen for the chow bell to ring so you can be seated for your chuck wagon style meal with all the fixings! Enjoy tender barbeque chicken, pork ribs, baked potato, cowboy beans, fluffy flying biscuits and the signature prickly pear coleslaw. Beverages such as lemonade, iced tea and coffee are included as well as the homemade caramel apple crisp for dessert. After dinner you will be treated to musical entertainment from the Blazin M Cowboys. For one hour these talented musicians share their musical skills mixed with cowboy poetry and an abundance of storytelling and comedy. Once the show is over, you don't have to leave just yet! Meet one of the Blazin' M Cowboys for a photo and a signed CD or sneak a peek at the resident Ghost Rider.